Home Latest News New Opel Corsa GSi On The Way! New Opel Corsa GSi On The Way! When the new Opel Corsa GSi follows the Insignia GSi onto the market this summer, it will be powered by the brand’s punchy 1.4-liter turbo engine with 110 kW/150 hp and 220 Nm of torque (fuel consumption l/100 km: 7.9-7.8 urban, 5.4-5.2 extra-urban, 6.3-6.2 combined, CO2 g/km 147-143 combined). Thus Opel’s “hot hatchback” is not only quick off the mark (zero to 100 km/h is covered in only 8.9 seconds), it also impresses with great elasticity – on its way to the maximum speed of 207 km/h, the Corsa GSi takes just 9.9 seconds to accelerate from 80 to 120 km/h in fifth gear. The “pocket-rocket” from Rüsselsheim is also part of Opel’s Euro 6d-TEMP rollout. When configuring the engine, which delivers a specific power output of more than 100 hp/litre, engineers specifically optimised responsiveness for great driving fun on winding country roads. Thus, the turbocharged engine with short-ratio, six-speed gearbox impresses with outstanding punch in second and third gears as well as a maximum torque plateau of 3,000 to 4,500 rpm tailor-made for spirited driving. 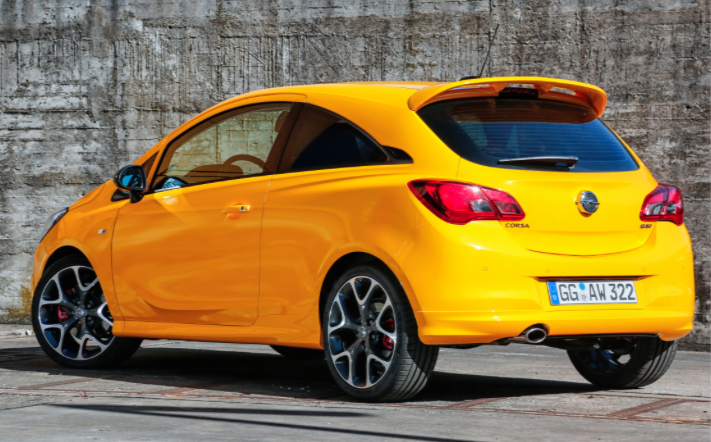 The Corsa GSi also emits pure precision: The sport chassis known from the OPC version and the brakes with red callipers ensure precise athleticism, outstanding handling and short braking distances also when combined with the optional 18-inch light alloy wheels with high-grip 215/40 R18 tyres. 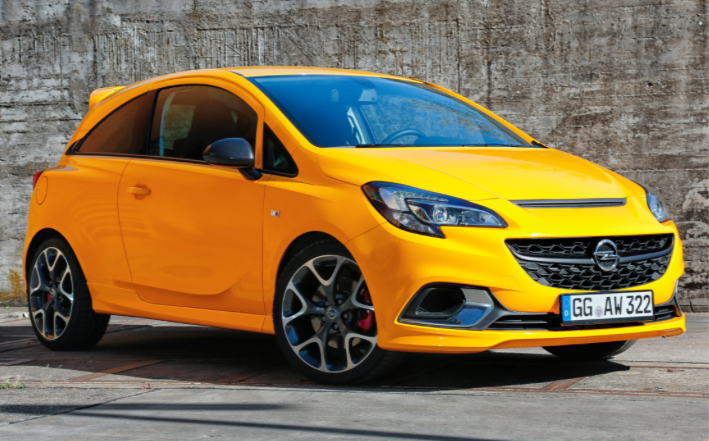 The high performance of the new Corsa GSi is matched by the athletic exterior looks. It has a characteristic design with large air intakes, sculptured bonnet, prominent rear spoiler and precisely modelled side sills. From the front, the cheeky Opel GSi fascia with large honeycomb grille and the central Opel Blitz supported by two wings, along with the exterior rear view mirror housings in carbon racing-look become visible. The large chrome-ringed design elements that are visually connected in a horizontal line via black crosspieces running across the front, along with the black traverse cleat on the bonnet support the impression of road-clinging athlete. The vibrant styling is also present when viewed from the rear. The prominent spoiler on the edge of the roof creates additional downforce, the sporty chrome tailpipe is framed by the vibrant design of the rear apron in body colour. The pure feeling of sportiness is also conveyed by the interior. The Corsa GSi driver sits on the optional Recaro performance seat and puts his hands on the sports steering wheel. Select the gear via the leather gearshift knob, put your foot on the aluminium sport pedal and pure driving pleasure commences.